Spotted tabby cat. She is a sweet cat. A spotted tabby cat personality is an idea that is completely misplaced. People actually think that a spotted tabby cat has a certain type of personality. I, for one, do not see a likelihood of a connection between the spotted tabby coat and a certain type of personality. There is nothing in any of the major or important books about cats that links the spotted tabby coat with a cat’s character. There is nothing on the internet from any serious resource that links the spotted tabby coat with character and neither is there anything in any research study that does it. Despite the fact that some people search for spotted tab by cat personality, we can say conclusively that it does not exist. 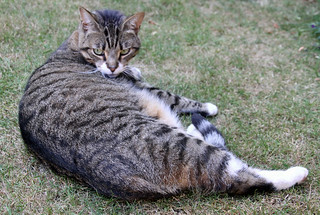 The spotted tabby coat is not confined to any particular cat breed. It is ubiquitous amongst random breed, feral and community cats across the world. It is impossible to think that millions of spotted tabby cats have the same personality. There are some real reasons why cats have a certain personality: genetic inheritance, socialisation and early experiences (“nurture” in the nature – nuture debate). If someone says that a spotted tabby cat has a certain character it is the same as saying a person with fair hair and a bald spot has a certain character. I am not saying that there is no connection at all between coat type and personality. I don’t believe there is a connection but I know some people will strongly disagree with me. Once again though I have never read about a connection in any of the major books on cats and there is no research on this that makes a link between cat coat and personality. You can check research papers by going to “Google Scholar”. The spotted tabby coat is probably the most common cat coats and the spots often merge to form lines. It can be difficult at times to positively say a cat is a spotted tabby. That in itself undermines the idea that they have specific personalities. Associated: Calico cat personality – “catitude”. Do you have a spotted tabby? Would you like to tell us about his/her personality? Do you think they have a certain personality and if so why? You can write an article about it using the form below or leave a comment. This entry was posted in Cat Behavior, Cat Coats, cat personality, Tabby coat and tagged cat personality, spotted tabby cat by Michael Broad. Bookmark the permalink. It’s the old stereotyping just the same as people are stereotyped by some. Yes all humans have human traits and all cats have feline traits but their personalities differ and every cat is unique just as every person is unique. Absolutely. Even cats of the same breed will have different personalities. People like to pigeon-hole and categorize cats. It is about stereotyping. All the conventional stuff about the personalities of cat breeds should be taken with a pinch of salt.